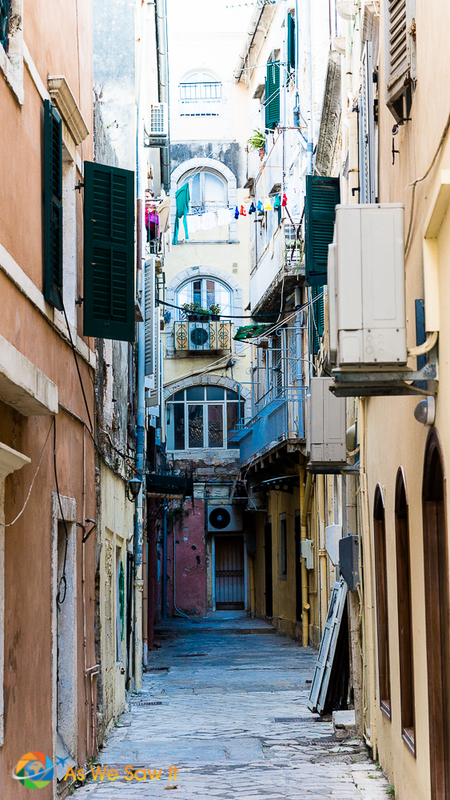 We spent a day in Corfu — or Kerkyra, as the Greeks like to call it — on a Mediterranean cruise. 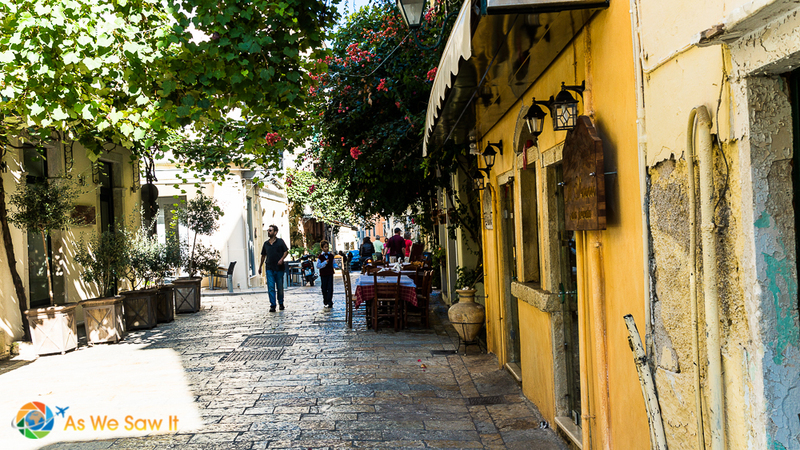 UNESCO has designated its old town as a World Heritage Site, and we wanted to see why. And besides, it's well known to be a hot vacation spot. 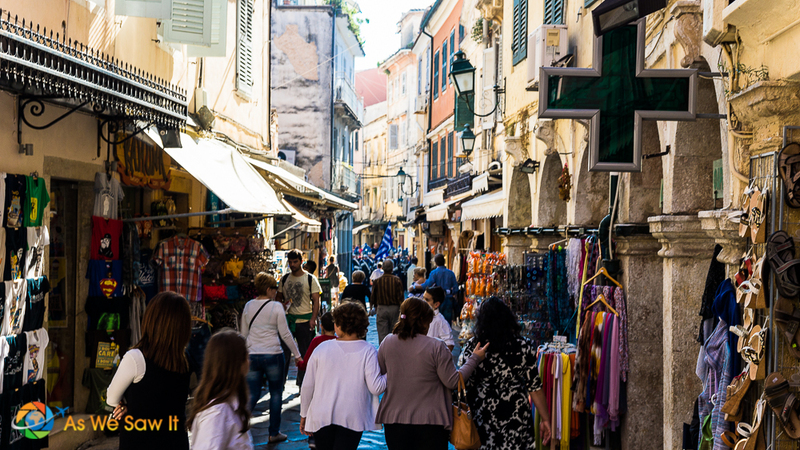 With a charming and picturesque town, sandy beaches, and sparkling, azure waters, Corfu has long been one of the most popular tourist destinations in the country. 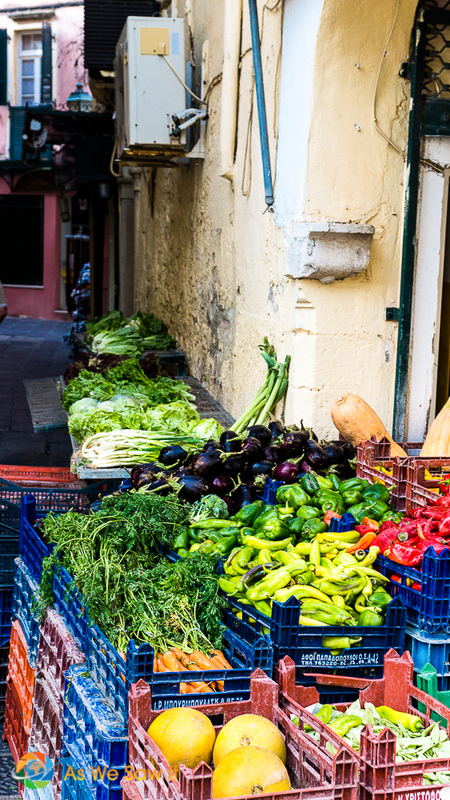 Couple all that with a warm, sunny climate, and plenty of flavorful olive oil and local wines, and it's little wonder why the island see cruise ships and holiday goers from all over flocking to its shores. 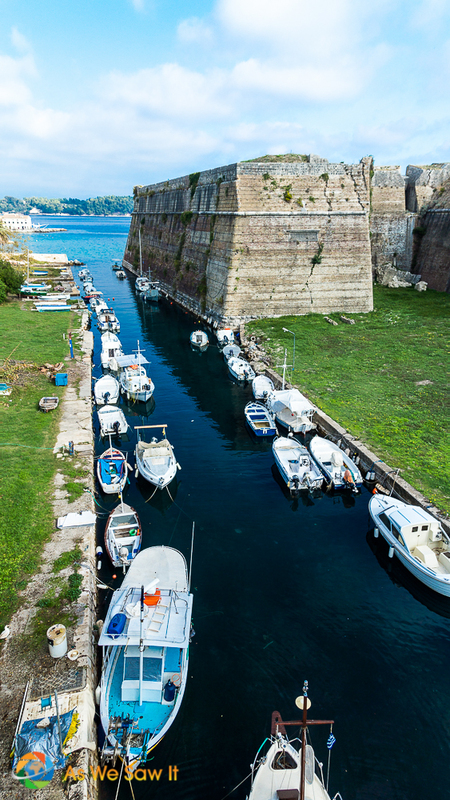 Corfu has been through a lot in its history. Its strategic location made it a coveted piece of real estate and so it has been under many different rules. 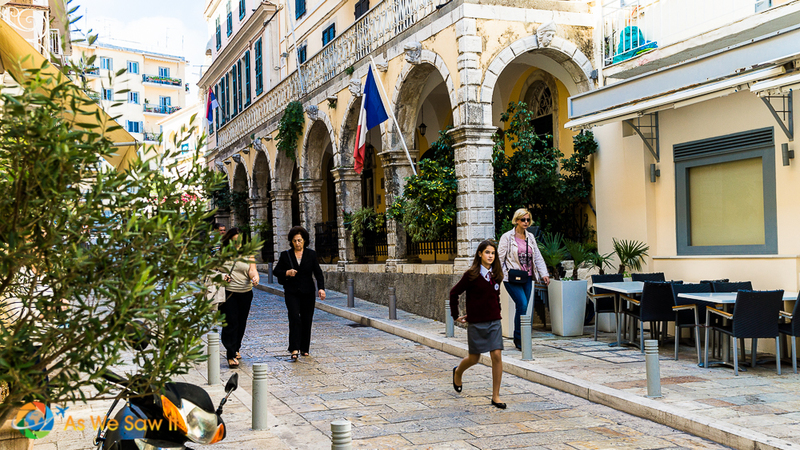 The end result is that Kerkyra has become a unique blend of many influences. 336 AD – after the Roman Empire was divided it became part of the Eastern Empire, whose new capital was Byzantium (a.k.a. Constantinople / modern-day Istanbul). 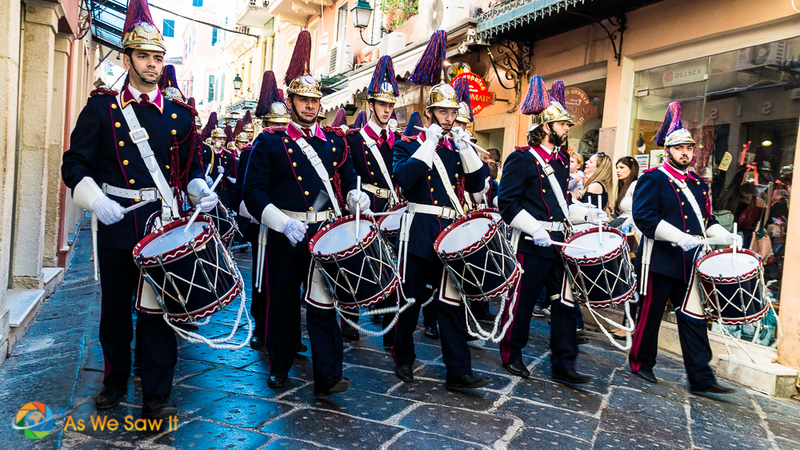 550 AD – the Goths invaded Kerkyra. 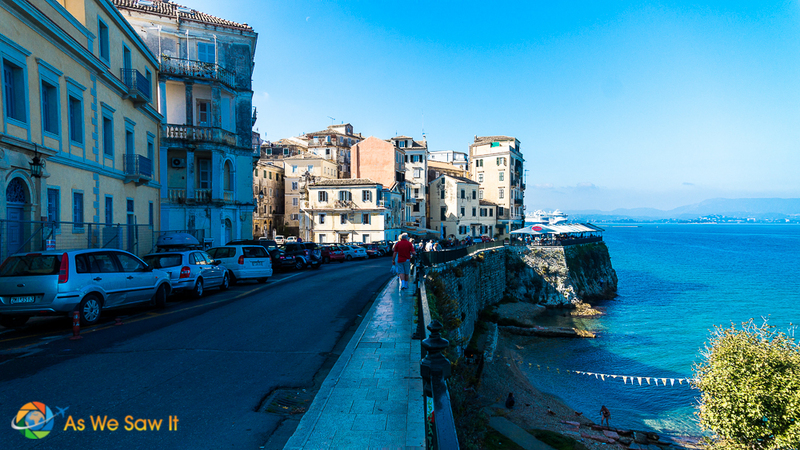 And that's where Corfu is today. 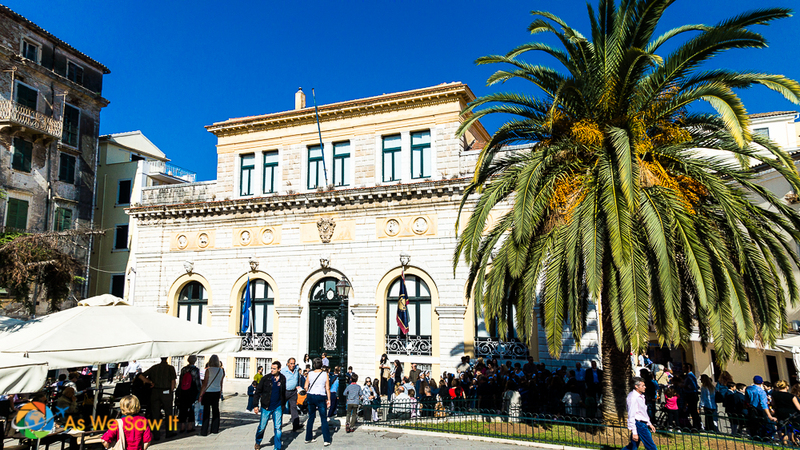 Our original plan had included a visit to Achilleion, an ornate 1890s palace outside of Corfu. That is, until we saw how many buses were waiting for other cruise passengers. 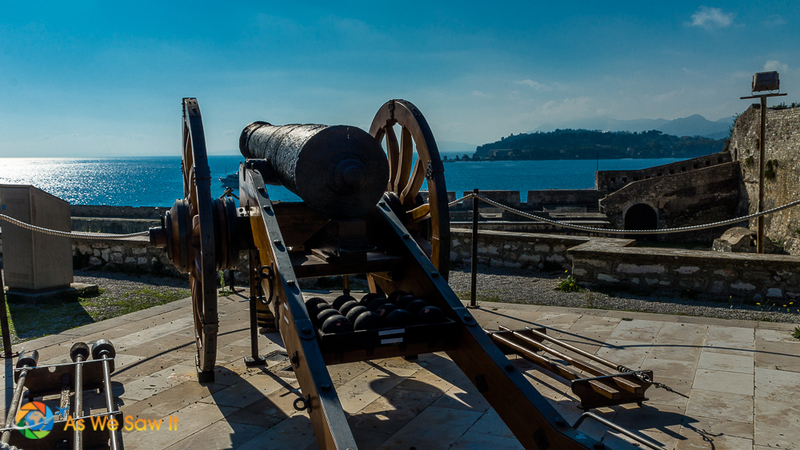 The summer palace for both Empress Elisabeth of Bavaria and Germany's Kaiser Wilhelm, Achilleion is filled with Greek statuary and has a breathtaking panoramic view of Corfu and the whole southern part of the island. Sometimes you have to adjust your plans when you travel, but it usually seems to work out well in the end. Today we discovered Ohi Day. 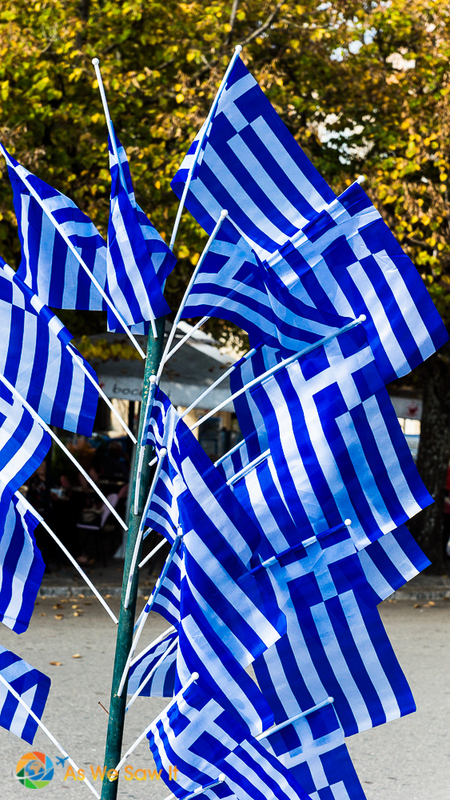 As we walked through the streets, we saw the blue-and-white of Greece's flag displayed everywhere. And I mean everywhere. We found ourselves scratching our heads in bewilderment … I mean, this was far above your everyday patriotic display here. We were surprised to discover that today was a national holiday. This was Ohi Day, the Anniversary of the No! October 28 marks the anniversary of the date in 1940 when Greek Prime Minister Ioannis Metaxas rejected an ultimatum he had received Italian dictator Benito Mussolini. In the wee hours of the morning Mussolini sent a message demanding that Greece allow Axis forces to enter Greek territory and occupy certain unspecified “strategic locations” or otherwise face war. Metaxas refused with the reply, Alors, c'est la guerre (Then it is war). 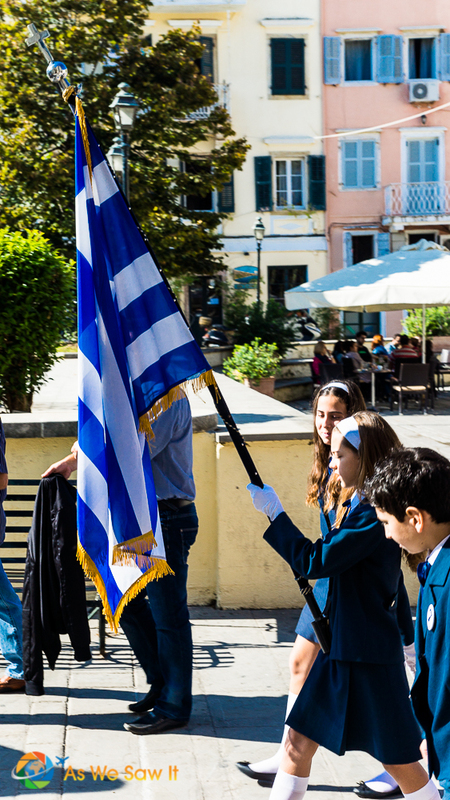 Within an hour Axis troops were at the border and Greece was pulled into World War II. 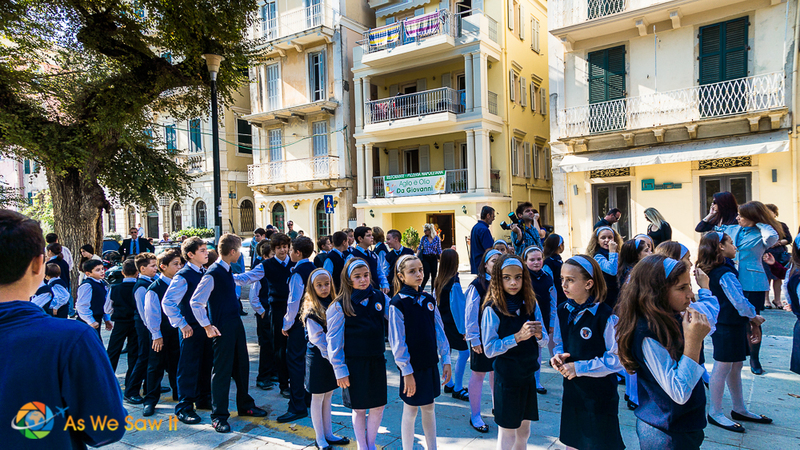 The Greek population took to the streets, shouting “όχι” (No!) and from then on, October 28 has been Ohi Day. 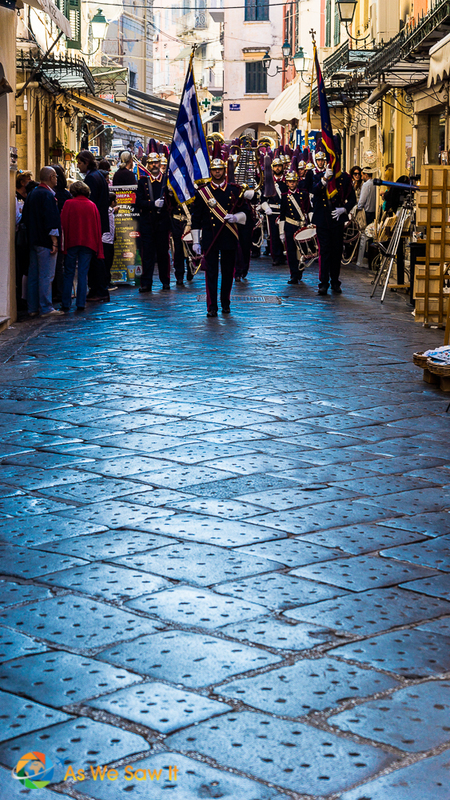 Everywhere we went students and adults were gathering, preparing for to parade through the Old Town's streets. Finally, hours later, we heard music. The parade was starting! We broke off our sightseeing (okay, wandering) and hurried to watch them pass by. It was worth it. What a colorful experience! 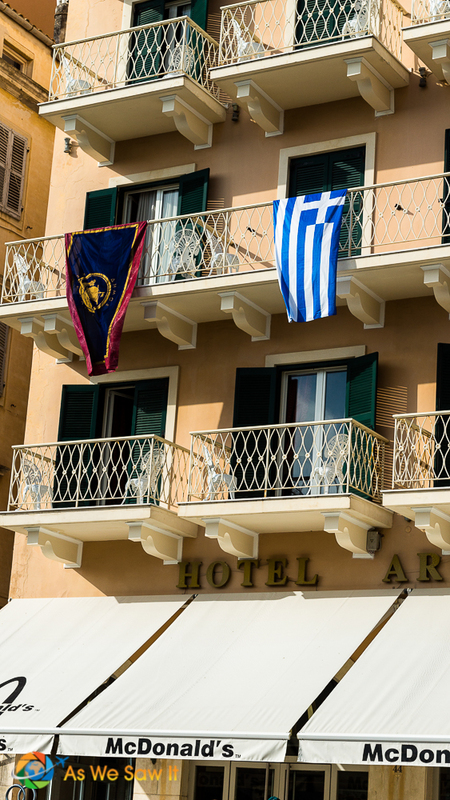 Tip: To experience Ohi Day yourself, plan your trip so you can be in Greece on October 28. 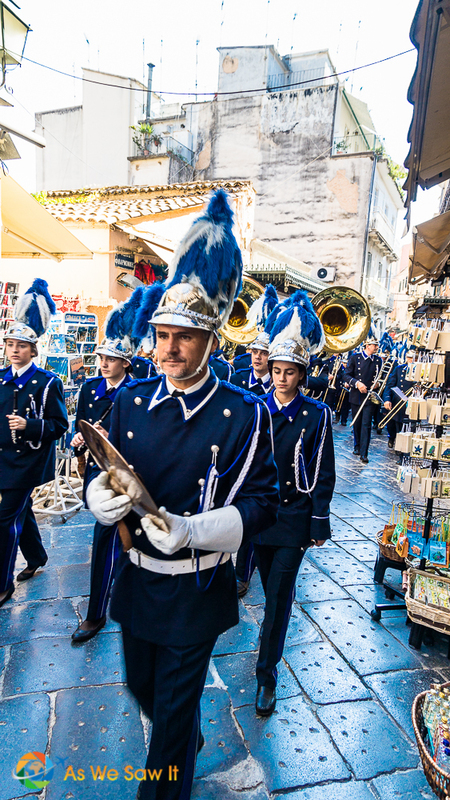 It's an annual holiday throughout Greece and Cyprus. As I mentioned earlier, Venice built three forts to protect the island. 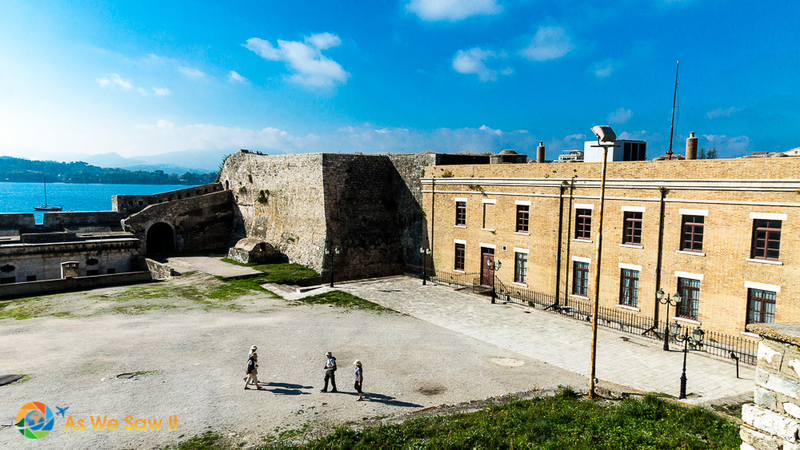 We visited Corfu's ancient Palacio Frourio (old citadel), which we had seen from the ship. It dominates the waterfront. 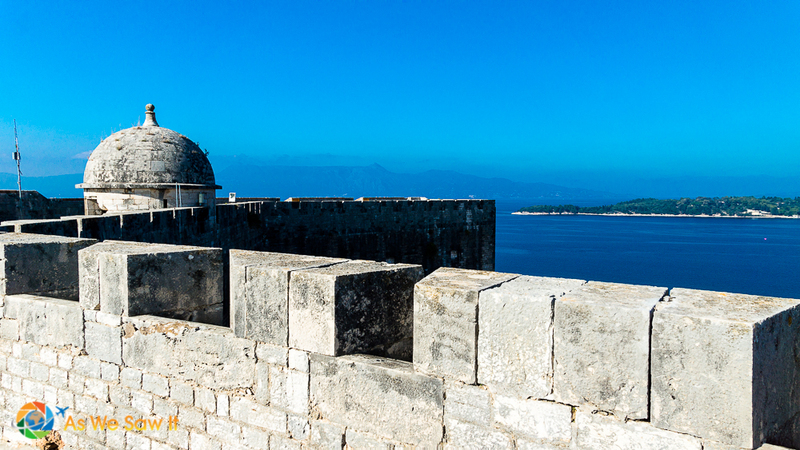 The Citadel is separated from the island by a narrow moat, but that doesn't deter anyone from visiting. 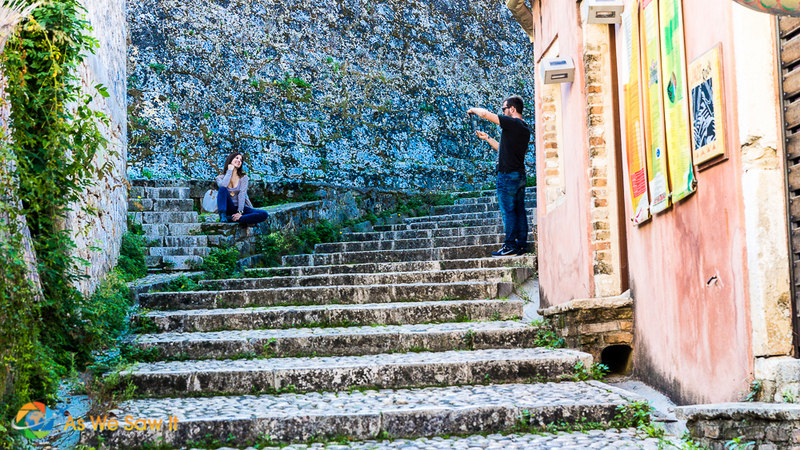 We joined everyone in crossing the moat to visit the ancient Venetian fortress. 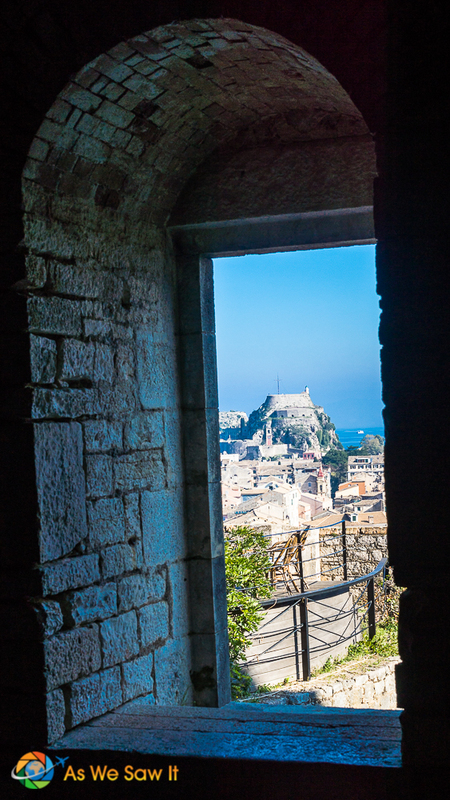 Look at this inredible view from Corfu's Old Citadel! 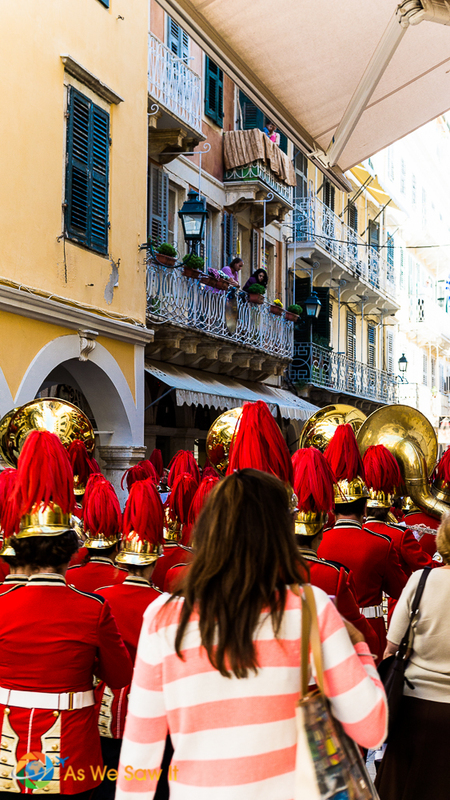 Modern-day warfare being what it is, Corfu's Old Citadel is more useful for cultural events and concerts. 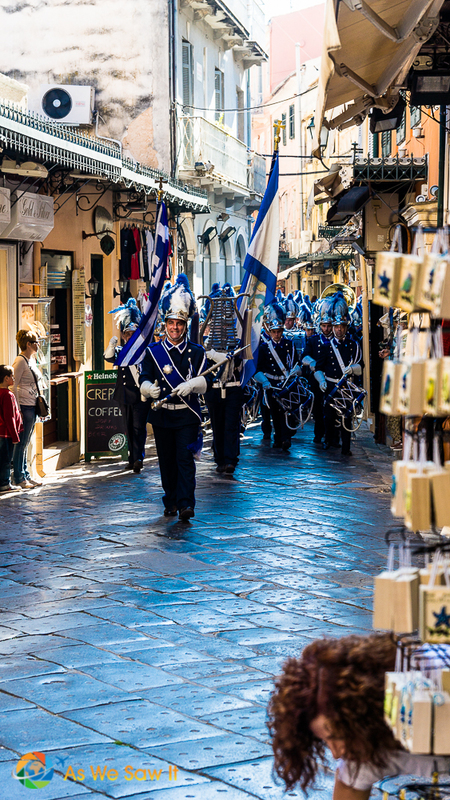 Most of the houses in the city's Old Town date from the 19th century, but you'll still find the odd arch here and there that is so typical of Venice. 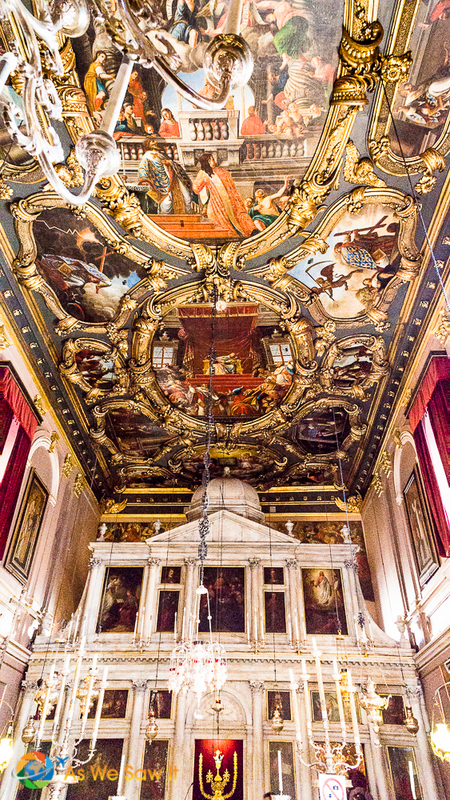 Venetian or not, gawking at all the structures was fun. 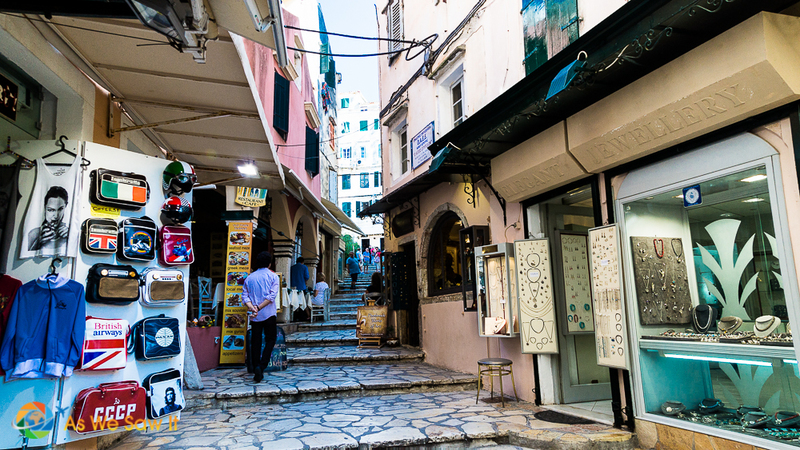 So was aimlessly meandering through Corfu's ancient bougainvillea-laden cobblestone streets, peering into intriguing shops and following staircases and alleyways just so we could see where they would lead us. 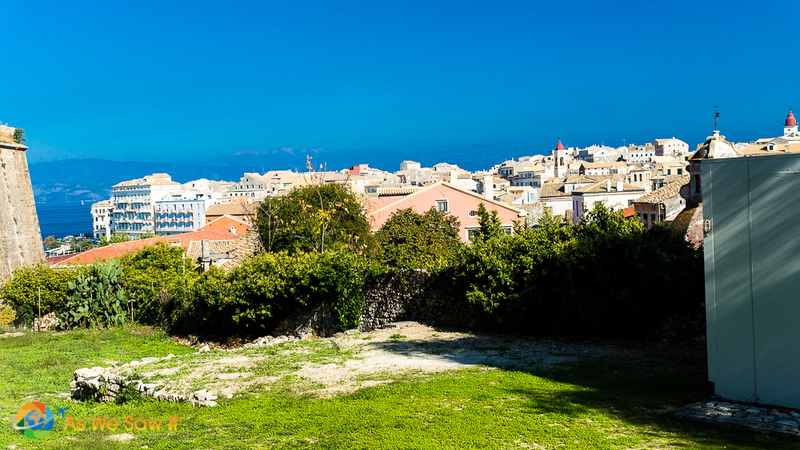 All that meandering rewarded us with a treat: It brought us to a hill above Corfu and its bay. 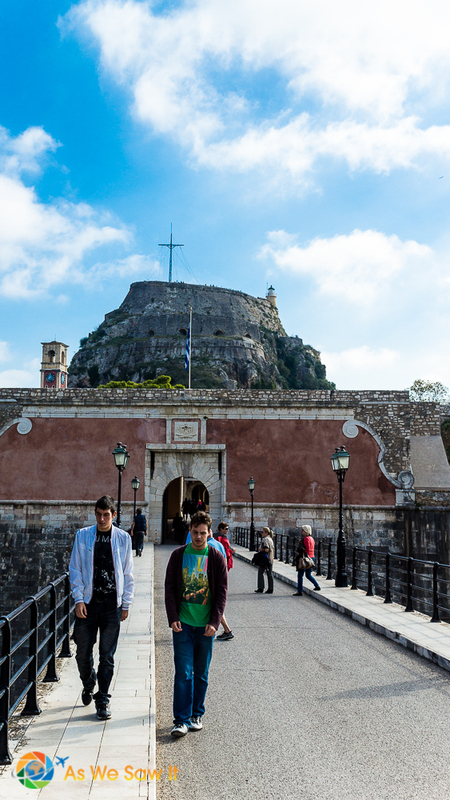 The treat got better when we turned to see another of Corfu's fortresses behind us, Neo Frourio (New Citadel). We bought tickets and went inside. The views alone made it worth the price of admission. 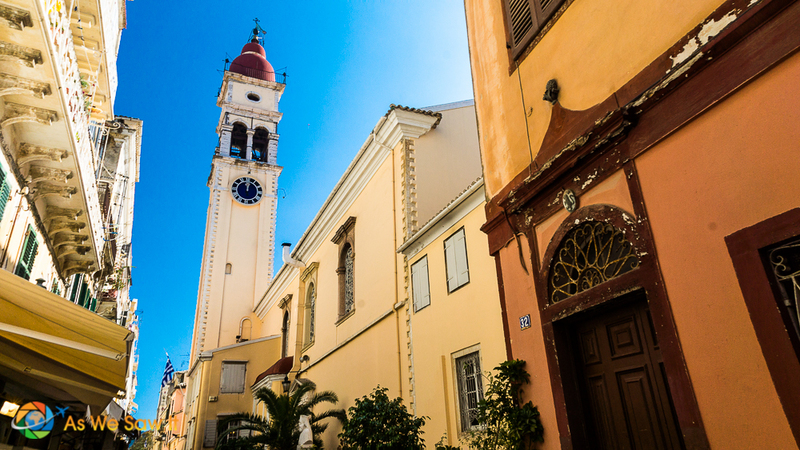 Corfu's main church is dedicated to its patron Saint Spyridon, a bishop who was essential in the First Council of Nicaea (325 A.D.). The saint's actual body still lies in a sarcophagus inside the church, to the right of the altar. It's quite an attraction for the faithful. 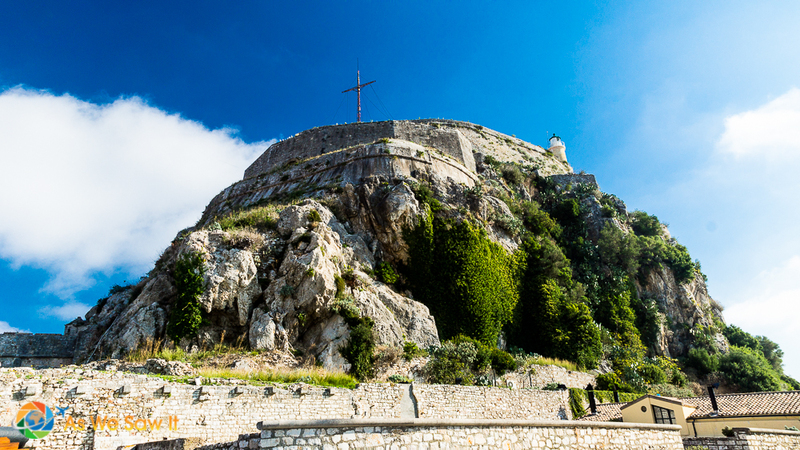 The bell tower at Saint Spyridon is the highest spot in Corfu. 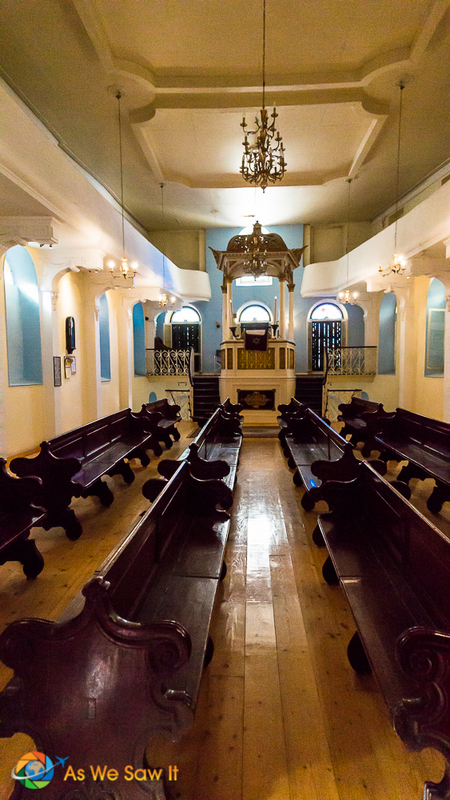 Dan was severely chastised when he began to photograph inside the church. 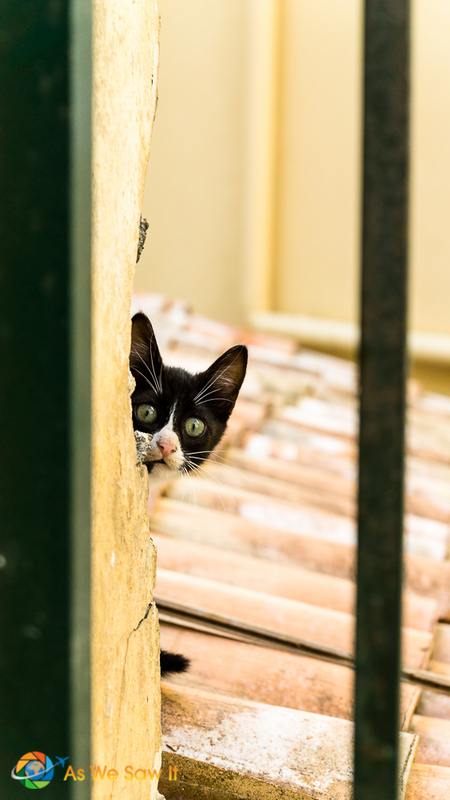 This really surprised us, because plenty of photos already exist on the Internet. We meant no disrespect. 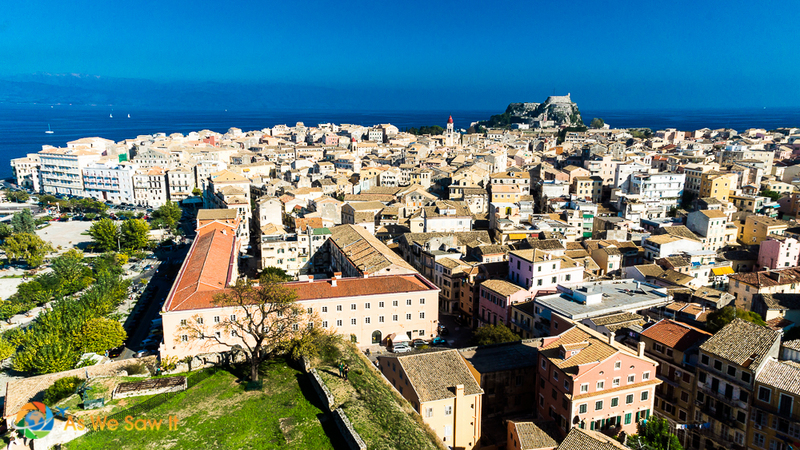 Quite the opposite, in fact, because this religious site is important to Corfu and we wanted to share it with our readers. He was able to get the shots he wanted, though. The caretaker and I got involved in a conversation about the church and the saint it is dedicated to. Saint Spyridon (born c. 270 AD) is honored in both Eastern and Western Orthodox traditions, and I enjoyed hearing him describe the miracles that have been credited to him. I could tell that the man is truly proud of his church. 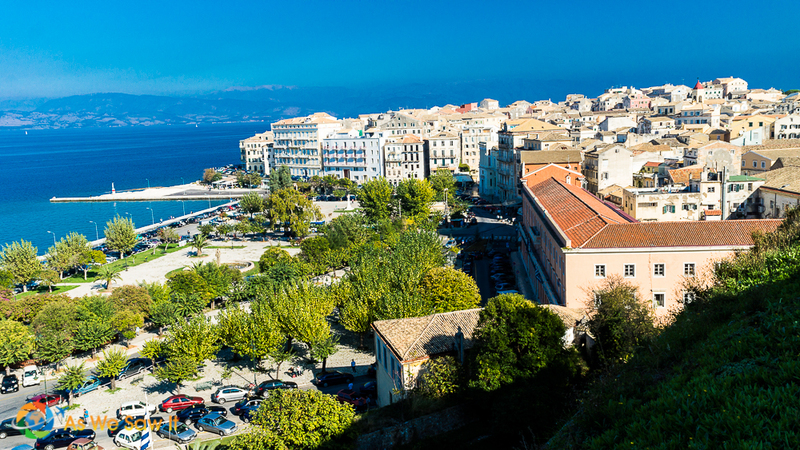 Almost 40 churches are spread around Corfu, both Orthodox and Roman Catholic. 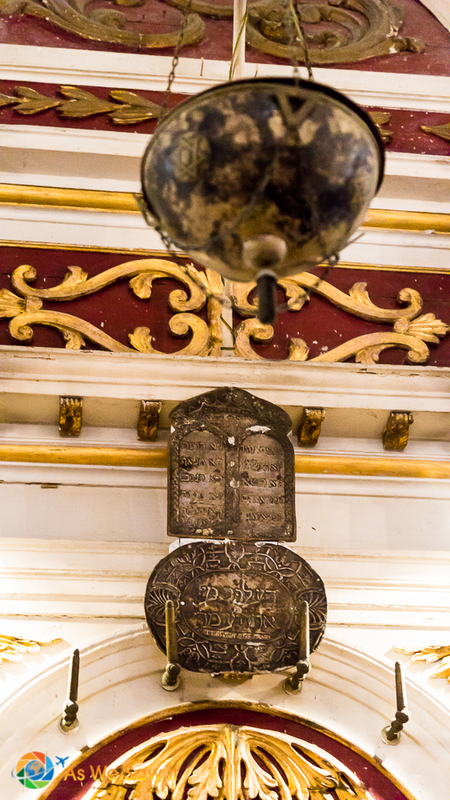 There is also a Jewish synagogue, the only one that survived Allied bombings during World War II. 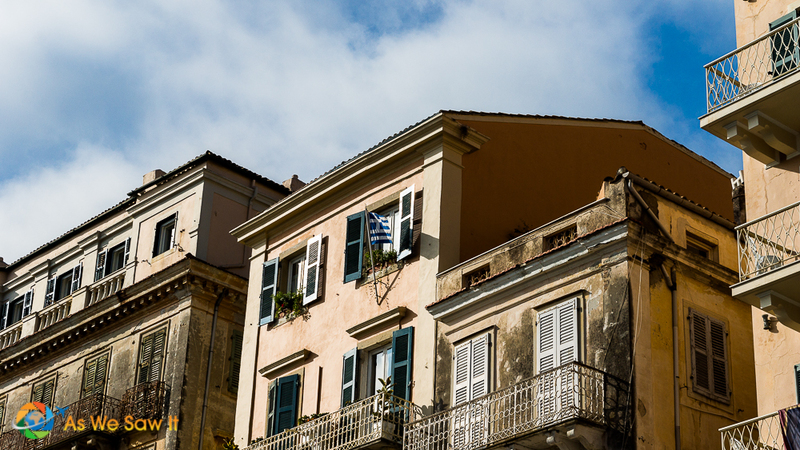 Corfu Town is a “living” medieval town. 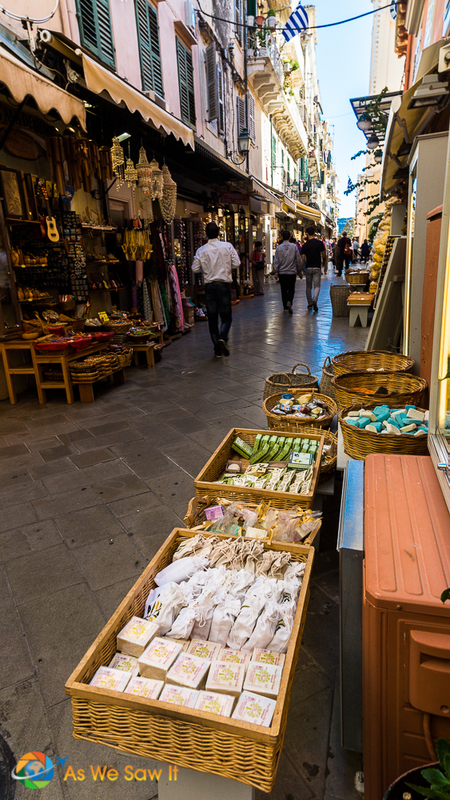 We love its delightful maze of winding streets and alleys lined with excellent shops and restaurants. 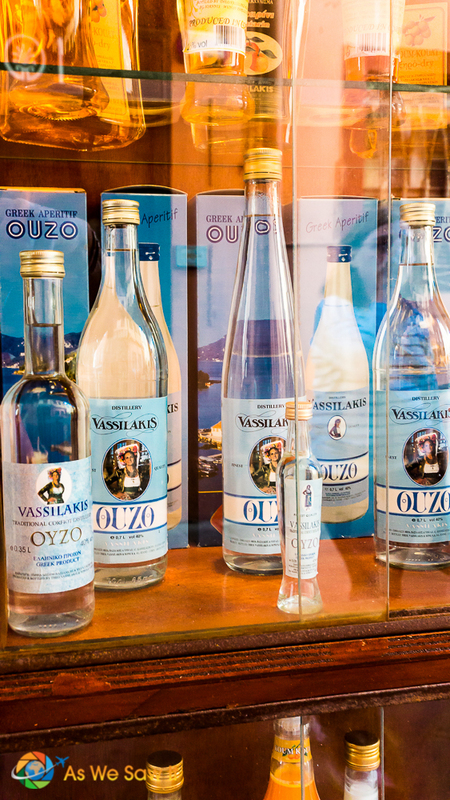 Not being souvenir-buyers we didn't walk into any of those stores but we saw everything from ouzo to jewelry stores to boutiques selling locally made dresses and lacy jackets, and craft stores featuring pretty embroidered cloths, local soaps and more. Lunch: Greek salad in Greece! Eating a foreign cuisine on its home turf is one of the things we most look forward to when we travel. We try to make it a point to try not only as many regional dishes as possible, but to see what is on offer at the markets. 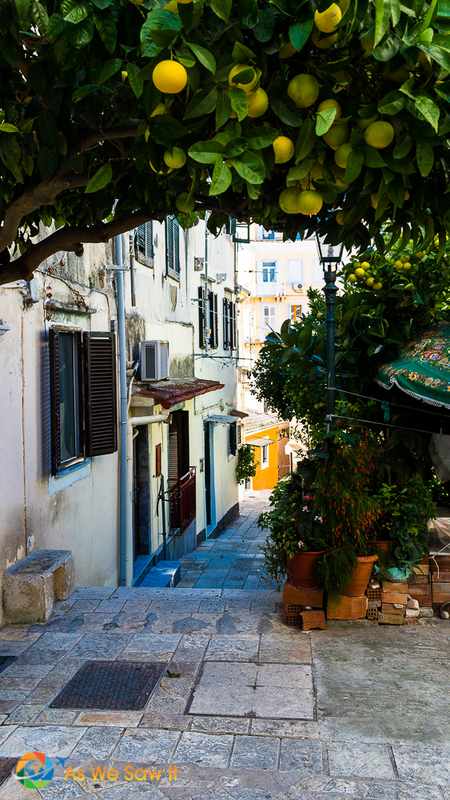 Corfu was our first opportunity to eat Greek food in Greece, although it was hard to settle on a place. They all looked good. 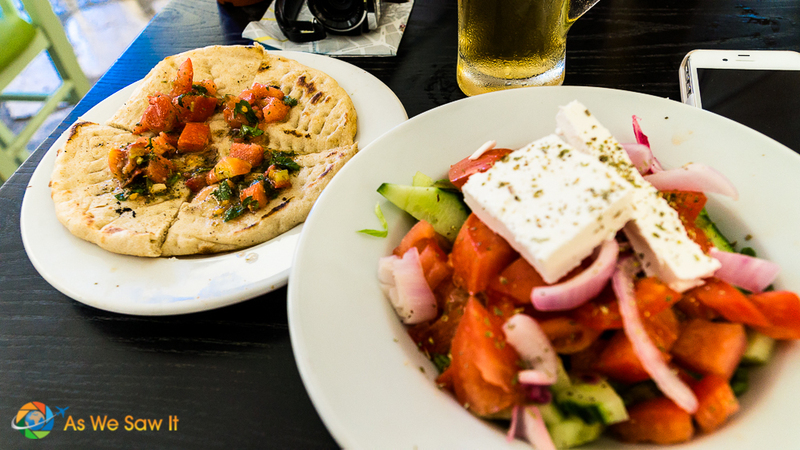 The weather was too hot for a heavy cooked lunchtime meal, so we decided to order something light, along with a glass of Mythos, the local brew. The Greek salad they offered (horiatiki salata) sounded ideal. Except … the Greek salad we got was not what we expected. It came simply dressed with a drizzle of olive oil—no lemon or vinegar—over a big, fat, massive block of feta cheese. The differences became even more pronounced once we had pushed the cheese aside and realized that there was not a lettuce leaf in sight. Call us converts. We liked it so much that we ordered the same lunch every day, even when we ended up in Athens. Actually, these salads were so delicious and so unlike the Greek salads we have had elsewhere, I had to share the recipe as a blog post, My Big, Fat Greek Salad Recipe. I hope you take the time to make it. I think you'll prefer it, too. 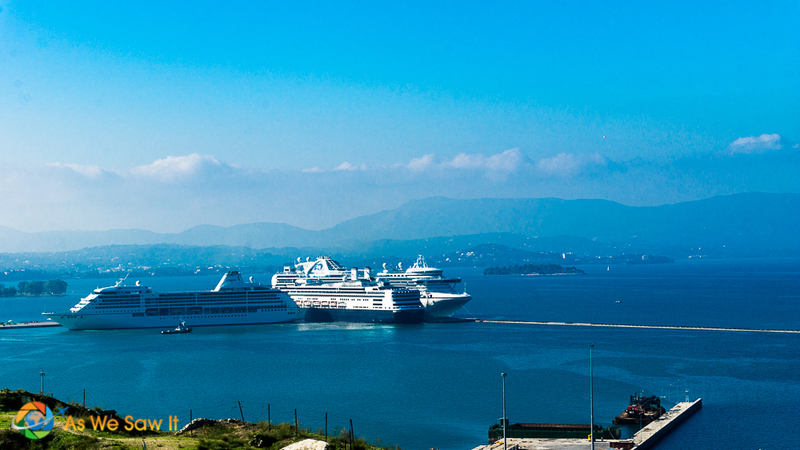 I will be visiting here as well as some other Islands while on a Mediterranean Cruise. 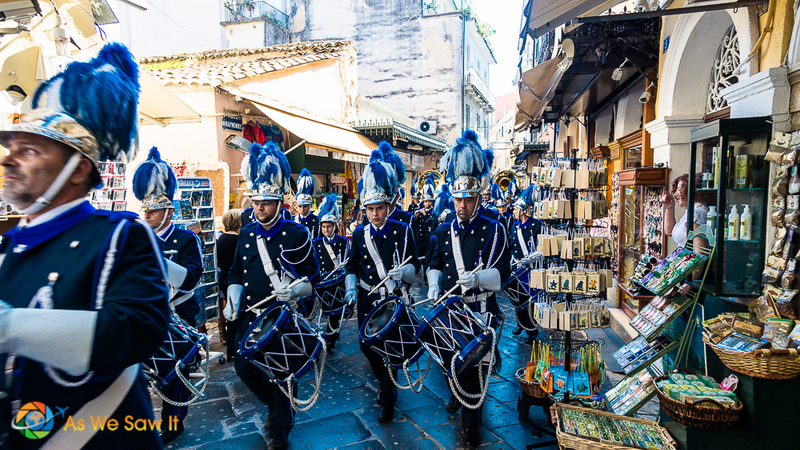 I typically like to NOT book excursion with the cruise line and do my own planning and exploring. I have read on the NCL’s site that shorts are not allowed while visiting inside the churches. Did you experience this? Will be vacationing in July and wasnt planning on pants and skits for the day. I don’t blame you. As a rule, shorts and sleeveless shirts are frowned upon in churches and temples, for men as well as women. I don’t know why covering the knees and shoulders are so important, but they are. 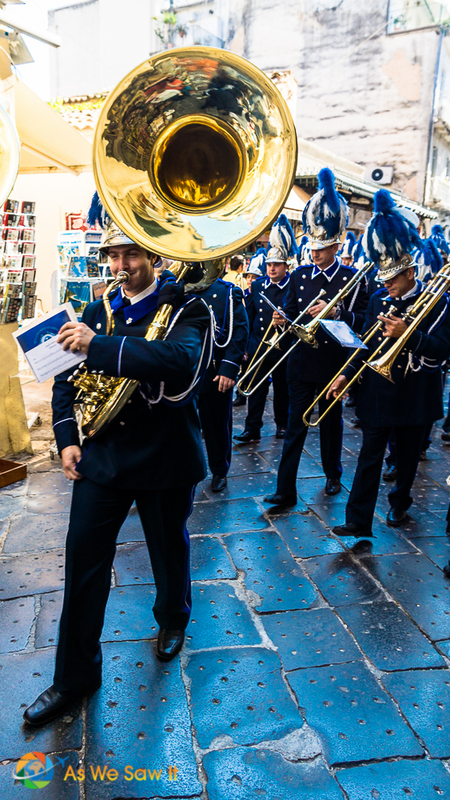 In any case, it’s been our experience that not all churches enforce the dress code, especially in the most touristed sites. I often carry a large scarf in my bag; it’s easy enough to wrap around my waist or drape over my shoulders if needed. By the way, capri pants are usually acceptable.